How to Write a Project Plan 3/5 - Work Breakdown Structure (WBS)? It is now time to break the project plan into even more detail by using the Work Breakdown Structure (WBS). If you don't know what this is you can find more information at what is a work breakdown structure? Basically the WBS enables big and complex project to be broken down into more mangeable phases allowing Project Managers and Stakeholders to make sense of it all. 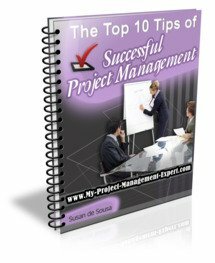 After all if you have a project with potentially thousands of tasks, it can be difficult to understand what needs to be done when. 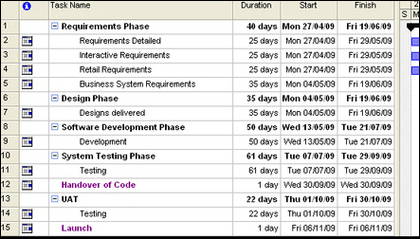 As you will see there are a number of Phases listed such as Requirements Phase. Within this you will see a number of tasks and deliverables listed. Now all these tasks are related to different requirements which need to be gathered and documented. By grouping them with a number of other related tasks it makes it easy to quantify this activity as well as to see when this phase will be complete and all Requirements will be documented. Now because of the way the project is being delivered you will see most of the Phases are around related work ie Software Development or Testing. However this isn't the only way Phases can be detailed. Another way of grouping tasks into Phases is by deliverable. So say a deliverable is to have all the Interactive deliverables completed. This may encompass requirements gathering, design, development and test. Now all these may seem unrelated tasks but put together they all add up to completing a specific project deliverable. It may seem like a great idea to have loads of Phases. After all if you do so then it surely becomes easier to check on deliverables and that deadlines are being met? however in practice projects never run that smoothly no matter how well planned. Therefore it can make sense to reduce the number of phases in order to give you some flexibility as well ensuring you don't have to repeatedly explain to Project Sponsor's why the project appears to be missing all its deadlines! Now Work Breakdown Structure's can get extremely complicated because after all it was developed by the US Military for use in huge defence projects. As such I'm not going to go into further detail on this because it isn't relevant for IT Projects. Certainly in 13 years experience I've never had to do so. Get your workstream leads into a meeting and discuss with them the best way to get the project delivered. Is it by grouping all activity by workstream or by deliverable? Always ask because each project is different either in terms of scope, resources, timeframes or budget and all these can have an impact on how to detail the Phases required to deliver the project. Further it is worth remembering that many ITQA functions like to hold End Stage Assessments (ESA) at the end of each Phase, therefore unless you want a great deal of additional overhead work prepping for these, be careful how many phases of work you document in your plan.